You can find Anna here, here on Facebook, here on Pinterest and here on Ravelry. In many paces. I cannot say anything particular. I look what other people do but also read a lot about history and theory of fashion, fashion design etc. I regularly browse knitting magazines in several languages. I look at what people wear. All my knits are seamless. This is the main feature of my design. As for some particular techniques, I use provisional cast on a lot, sometimes three needle bind off. I have developed my own techniques for binding off that give you different degree of elasticity and are combinable with each other. Probably, intuitively. I usually have patterns from S (bust circumference 84 cm) to XL (bust circumference 120 cm) but when asked, I can do XS or XXL. It varies, of course, because sometimes stitch patterns you use give you, say, 86 cm or 119 cm but this is not a problem. Of course I look! And not only knitting designers but also fashion designers in general. We all get influenced by everything. It is normal. There are no pure cultures or pure languages, everything is in context. You go out in the street, you see people around you wearing particular things, you see architecture, objects around you. I am an analytical person and want to observe and draw my conclusions. I live in a country where knitting is taught at school. Everyone knows elementary things about knitting, even if one does not knit. I believe that a pattern is not a textbook for knitting. When I write patterns for the Estonian craft magazine Käsitöö (Handicraft), the editor deletes things like "remember, if you are knitting in the round, to get stockinette you have to knit all stitches in all rounds". True, you cannot be equally appreciated by all audiences in that case but I have been often told by some knitters that redundant information distracts. Imagine you are quite advanced or at least have an intermediate level in some language. You are reading a book and coping fine but every word or almost every word has an English (or whatever is your language) equivalent in footnotes. It distracts your attention. But you would not give this kind of text to a beginner either, you need a different type of text. When I teach my methods, I always emphasize that one has to think along. If one does not wish to think, it is fine but then I hardly can be useful to such a knitter. I teach strategy: how many stitches is a secondary or even a tertiary question. What am I doing and why? What kind of advantages or limitations this particular construction has? Where to increase or decrease and why? What is a right proportion and pace of increases to get a nicely falling tube collar? And so on. These are the questions one has to ask. Recently I have started practicing pattern recipes or design-a-longs. Many knitters like this. Take my recent design Improvisatsioon: http://www.ravelry.com/patterns/library/improvisatsioon . You have the same construction principle, same number of stitches to cast on etc but three different stitch patterns. And if you want a different lace stitch, the pattern explains what criteria this lace stitch has to have. So, to sum up, I am not "dumbing down" patterns. I may lose some audience but I also gain another audience. It depends. It is difficult to find testers for larger sizes. Sometimes I ask a fellow knitter just to read the pattern and to determine whether it makes sense. Usually I have some fans who ask for a pattern and then I tell them: fine, but would you test it for me? Did you do a formal business plan? Do you have a business model that you have emulated? How long did it take for you to be able to support yourself? I will answer all business related questions in one. I am a professor of linguistics in Tallinn University and this is where my salary comes from. So I don't have to think about business and surviving. What I get for my designs and teaching is a nice addition, so I can afford buying yarns, books and magazines. No, I would not say so. I appreciate advice now and then, especially from Finnish-Estonian designer Suvi Simola who also has a similar analytic approach to knitting. No. When my patterns are published in magazines, the editors do it according to their format. So far it has not been a problem. I live in a small country (1.3 million population) where everyone knows everyone and many of my colleagues at the university do handicraft and appreciate what I do. It gives you energy. And I think that if you like what you do, you cannot separate your work from the rest of your life. Depends what kind of criticism but I have not had any serious cases. Be yourself, find your style and aesthetics. Be brave. Be analytical. Reflect. Look around. I am afraid I cannot give any practical advice on running a business. I would place myself metaphorically on the intermediate ground between knitting design and fashion design. 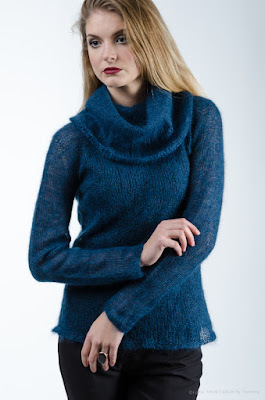 When I design my knits, these are not just isolated pieces of clothing: I imagine how I (or anyone) would wear it, with what, how I would style them, what jewelry goes together etc. I believe that personal style comes from within and have a strong feeling what is mine and what is not and what could be tried out. It was a great experience to participate in Tallinn Fashion Week in 2014 together with a young fashion designer Mattis Meekler: he made clothes from fabric and I made knitwear for our collection "Textures". I would love to work together with a fashion designer. It is possible only if you have similar aesthetics. It was also a wonderful experience when I was invited to give a lecture about knitting to the future fashion stylists, students at Estonian Art Academy. So I would like to continue writing my patterns and teaching and, on the other hand, try to find a way of cooperation with fashion designers.